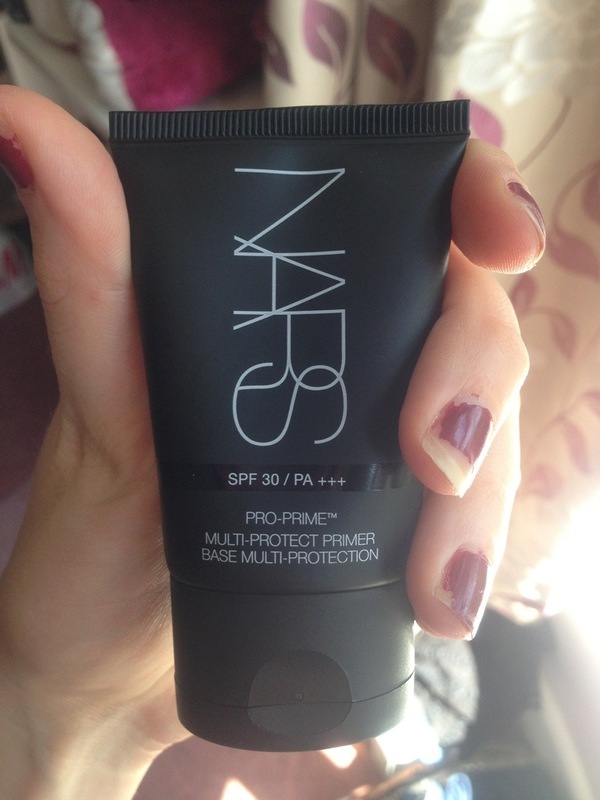 Summer Favourite: NARS SPF 30 Pro-Prime Multi-Protect Primer | Becky Alyssa's Beauty Box. Firstly I have to say I seldom spend over £20 on anything beauty-related (exceptions made for my Clarisonic & Bobbi Brown HGs of course). However I was out shopping with my mum several weeks ago & just couldn’t find a facial sunscreen for the sunny weather that didn’t make my face feel sticky or oily – working in Cornwall on a film set last year left my face horrifically sunburnt which is an experience I hope never to repeat (the painful sunburn, the job was amazing). Plus the UK doesn’t go for marketing high SPF cosmetic products aside from generic body sunscreen since we only tend to have a couple weeks of summer before the greyness & rainclouds return. We paid a visit to Space.NK (again somewhere I rarely go as it is a bit pricey) and the sales assistant listened to my concerns and recommended me a few. I tried a very similar product by Laura Mercier which had a nice smooth texture but felt a little too sticky. I went for the NARS product because it was extremely lightweight on my skin, had a reasonably high SPF, was not sticky at all & doubled as a primer as well as a sunscreen. And unlike their typical rubberised packaging this is simply a matte black plastic tube which still looks smart & expensive on your dressing table. I’ve been using this since – it’s ideal for the hot sunny days we’ve had lately, especially if you’re desperately pale like me. It’s perfect to wear alone or under a BB cream/light foundation when you’re out & about in the summer and the SPF definitely has not let my fair skin down, even when I’ve been out at the car boot sale or shopping on the high street for hours. Absolutely no traces of sunburn! Although many BB creams and foundations contain SPF, if you burn easily you definitely need the extra protection (as I have found out the hard way too many times). Plus it’s so smooth & light on my skin I don’t even notice I’m wearing it. I recommend this primer/sunscreen to anyone else with fair skin looking for an SPF product for summer – sunburn isn’t a good look on anyone. What’s your favourite sunscreen, cheap or high end? This entry was posted in Uncategorized and tagged nars, primer, review, summer. Bookmark the permalink. ← Nails Inc. Lucky Dip Surprises! This primer is one of the best! Agreed! There are quite a few negative reviews around on it but it’s ideal for hot summer months!